Moreover with the help of computers and laser-cutting technology, glass tiles are much better looking now in different designs. People have choices when it comes to glass tiles. Technology has also helped in making the glass tiles of today more durable. In other words, with the anti-slip coatings they are designed in, we won\’t have any worry on slipping down on them and breaking these glass tiles. Below you will find instructions on how to adhere a glass tile. Follow glass tile manufacturer\’s instructions. First of all you must read the instructions of the glass tile manufacturer and follow its requirements accordingly. 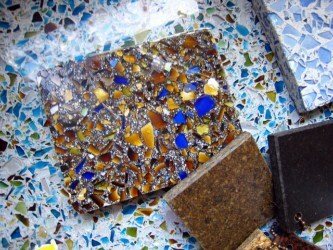 Then you need to mix a thin set that will help you in attaching your glass tile, but with only a thin layer. Make sure not to set the thin set too thickly or unevenly because it may be seen through the glass. Next, you have to cover the tile back using a thin coat from the thin set along with the trowel ensuring that it is not heavy in one area and not too thin in the other. The back of it needs to be covered thoroughly with a smooth layer. If the glass tile you are using is thick, you just need to apply a thin layer to the surface of your wall in order to adhere the glass tile. Always ensure that you wear gloves for protection from the thin set that you are using. Then, attach the tile to the area and put on an equal amount of pressure to its four corners but do not push it too deeply causing the thin set to ooze out of the side of your tile. In order for the tile to be secured, you have to make sure that the thin set is dry thoroughly. After that, you need to mix the grout and then apply it along the tiles, plus also ensure that you push the grout into gaps found in between the tiles. Once done, use a damp sponge to wipe off any excess grout. The grout must be dried thoroughly and finally, you can do some polishing of the glass tile by using a damp rag.